Example 1: The people picker takes too long to find a user. The szenario is that you search for a user and you wait 1 or longer minute before the user is displayed in the people picker. Replace the domain names and the web application url for your needs. We take the example 2. What if you set the stsadm command in the second example but you can't find any user from the other domain ? I use first a powershell script to check if I can contact the new DC. You have to know a little bit how ldap queries are working to understand the script. 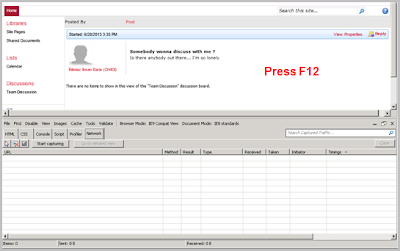 Just adapt the DirectoryEntry setting and enter the login in DisplayUser( login ) at the bottom. When this script works without any problems. I go further by digging in to the ldap traffic between the SharePoint Server and the DC. 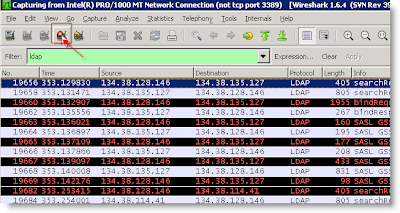 The tool I use for monitoring the traffic is WireShark . 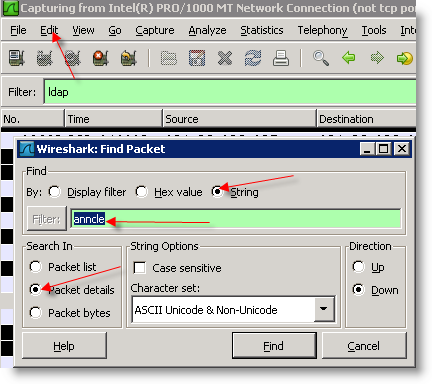 Install WireShark on your frontend server. Start it. Select the adapter to connect and start monitoring the network traffic. You'll see lots of traffic. 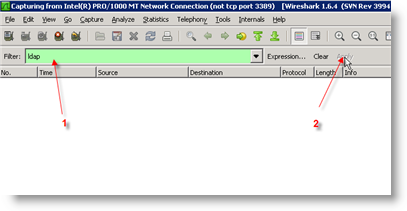 Now enter "ldap" in the filterbox and click on apply to only see ldap traffic. The next step is to create ldap traffic. Therefore open any SharePoint Site. Just go to the site actions menu and select Site Permissions. Try to search a user in the new AD. As an example I search a user with the loginname "anncle". 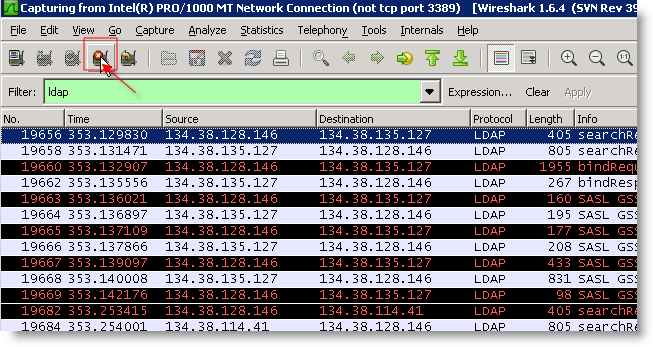 You will see now some traffic in the WireShark. Click on stop monitoring. 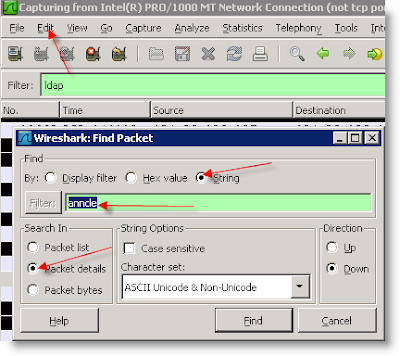 Click on Edit Menu and then on "Find Packet". Give the loginname you searched for into the search box. Now you can see the ldap query, the time which the DC's need to respond and which DCs are contacted. With all that information it is easier to debug and find out the real problem. In my case I check the query which the WFE send to the DC. With right click you can copy the query and you can try and modify it with Tools like LdapAdmin. In my case, by inspecting the ldap query I found out that I had a filter which I set prior to improve the performance. By removing the filter from the sitecollection everything worked fine. Hey Baris,I am having an issue with the people picker on an SP 2010 site, it uses Active Directory and seems to work correctly if I log into the SharePoint server and access the site, however when I access the site when im not logged into the server the Add button on the people picker seems to be disabled so I cant add the users that I select, do you know why this could be? sorry never had that before. There is also no add button on the people picker. Which button do you mean exactly? There are two one with the head and the other with the address book. Hey Baris, when you click the browse button on the people picker a popup opens up allowing you to search for and select the users to be added. The problem is that the Add button on that popup appears to be disabled so I cannot select any users. The Add button only works if im logged into the SharePoint server. 1.) Reading the js function you have to select in the upper box an account to enable the button. I know it's a stupid answer but sometimes it is the easiest answer. 3.) You have a custom Http Handler on your SP Server which perhaps blocks the loading of some scripts like the /_layouts/entityeditor.js file. Other question: Can you search after users ? And are they resolved when you press enter in the search box ? Great blog,thanks for sharing this article .Keep posting articles like this . If the dialog box appears you don't have an address bar to pick up the called URL. To see which URL is called when you edit or open a list item use the Internet Explorer Developer Tools. Open your source list in the Internet Explorer. Press F12 to open the developer tools. 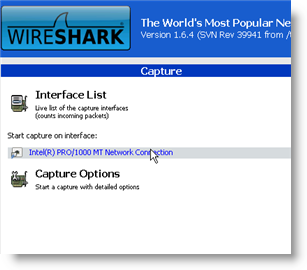 Click on the "Network" tab and then on "Start Capturing"
Now click the link you want to track. You'll see the requests listed and you can also copy the urls for your need. SharePoint usually calls the /_layout/listform.aspx with the list parameter. The form then redirects to the appropriate list form.